With the Palestinian bid for statehood looming at the U.N., how we deploy laughter -- or avoid it altogether -- can serve as a barometer for the willingness of societies to consider change. Quiz: What do Joan Rivers, my friend's baby and the mayor of Ariel have in common? Joan Rivers told an appreciative Ottawa audience last week about research claiming that 100 laughs per day is the equivalent of 10 minutes of aerobic exercise. Today, my friend's baby enjoyed her first laugh, and her Facebook friends got to watch it on video. And the New York Times featured a video interview with Ron Nachman, the mayor of Ariel, a settlement 10 miles into the West Bank. When asked by the reporter whether the small city of Ariel would have to be abandoned in a future Israeli-Palestinian peace agreement, Nachman (who has been mayor since 1985) responded with four seconds of hearty laughter. For comedians, laughter is professional currency, and for their audience, it's an escape, with apparent health benefits to boot. Yoga buffs can now do both at the same time. For babies, laughter is transformative, the beginning of wonder and intimacy and the expression of a sense of safety; for parents it's hope and connection and possibility. But for hardened politicians in conflict zones and their constituents, laughter can be a vessel for a cynical clinging to the status quo. 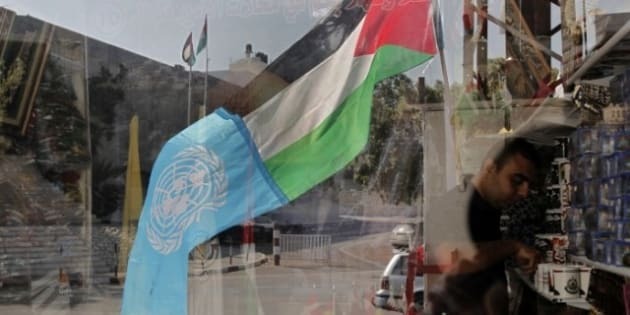 With the Palestinian bid for statehood looming at the U.N., political stakeholders will soon have to choose between holding on to their cynical conflict stance, or contemplating hope and possibility. How we deploy laughter -- or avoid it altogether -- can serve as a barometer for the willingness of societies to consider change. Many sitcoms use laugh tracks to remind us what is funny and to make us feel a little less alone as we sit in our living rooms watching entertainers trying to connect with us through a little glass box. Abraham and Sarah laughed at God's announcement of Isaac's impending birth. Sure, theirs was laughter of disbelief, but it was also one of hope. Laughter is distinctly human. As Bible scholar Aviva Zornberg writes: "The very fact of laughter places man firmly, absurdly, at the center of his world." In the war-weary Middle East, sometimes this human quality of laughter can bridge the divide -- as writer Sayed Kashua manages to do in his honest and touching columns and through his excellent television sitcom, "Arab Labor" (Avodah Aravit), and as Israeli pop group Hadag Nachash does in its parody of the multi-directional divides in Israeli politics. Sometimes the desire to laugh leads to the gallows humour that helps Israelis and Palestinians cope: Israeli gas-mask cartoons during the 1991 Gulf War; the spate of Intifada jokes where Palestinians poked fun both at soldiers and at their own factionalism. Sometimes the humour is demeaning and terrible and not at all funny, like stories emerging after Operation Cast Lead about IDF soldiers wearing T-shirts featuring hateful images of Palestinians. And sometimes one isn't at all sure where to find the humour, like in the case of soldiers from the IDF's Nahal Brigade who broke into a hip-hop dance while on patrol in Hebron. It was never clear to me whether the joke was on the Palestinians, or on the banality of the occupation itself. Israeli author and peace activist Amos Oz has written that part of what makes fanatics thus -- and in the Arab-Israeli conflict there is no shortage of them -- is their inability to laugh at themselves. Was Ron Nachman laughing at himself? Perhaps. But he was also conveying the disturbing message that what most of the world has come to see as pragmatic, he, and thousands like him, outright rejects in the name of power and ideology. Perhaps this war-weariness is why Etgar Keret, one of Israel's funniest authors who is graced with the wild imagination of a dreamer, avoids the topic of the conflict altogether in his work. Israel's most successful graphic novelist, Rutu Modan, draws sad comic books, and Joe Sacco, who has immortalized the Palestinian struggle through pencil, angry ones. Whatever happens in that multilateral global forum, Israelis and Palestinians will have to eventually extricate themselves from the other's chokehold so they can have the breathing room to laugh again -- and in turn to see the humanity and collective needs of the other side. Palestinians see the occupation and continuing settlement enterprise as a prison, and Israelis see the failure of the Palestinians to withdraw from maximalist refugee return positions as a tightening noose on the fact and ideal of Jewish sovereignty. As U.S. House Republicans put forward what can only be seen as a tragically comical resolution suggesting Israel's right to annex the West Bank, and Netanyahu and Abbas feel out the idea of using New York -- that proverbial city of laughter and tears -- to venture a few limp steps of diplomacy, the world is sprawled out on threadbare sofas, fatigued and jaded, waiting for the laugh track to signal that the conflict may yet have a happy ending.